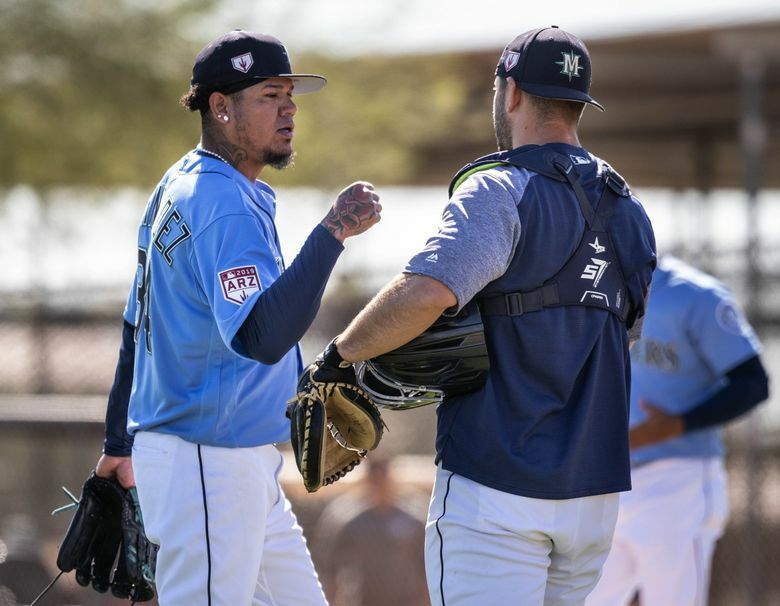 There is dreamy hope from many fans that Felix Hernandez, who had his best years wasted on bad teams, might rekindle something close to his old glory for his last year in Seattle. PEORIA, Ariz. — If spring training results and statistics are truly meaningless, something that is often said and written this time of year, then the good can’t be over-praised and the bad can’t be over-dramatized. And yet with Felix Hernandez, the erstwhile ace of the Mariners, there is no such logic about his every outing. Given his struggles of the past three seasons, which featured decreasing production and increasing fan backlash, and the circumstances of this being the final year of his $175 million contract. He’ll make $27 million in what will be his final season in the organization that signed and cultivated him into a superstar. And still there is dreamy hope from many fans that the former Cy Young winner, who had his best years wasted on bad teams, might rekindle something close to his old glory for his last year in Seattle. 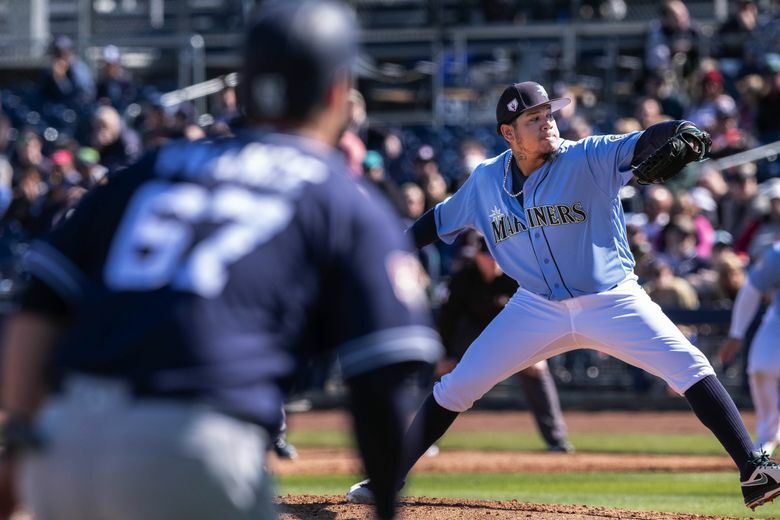 Just how this season will play out and how Hernandez ends his time with the Mariners is more unpredictable than one of his outings. 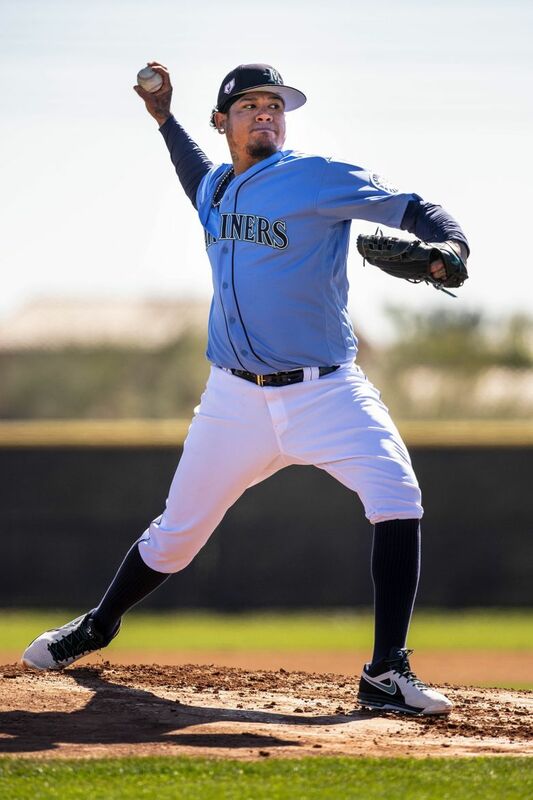 His first start of the Cactus League season displayed the uncertainty and inconsistency that followed each time he has stepped on the mound the past three seasons. 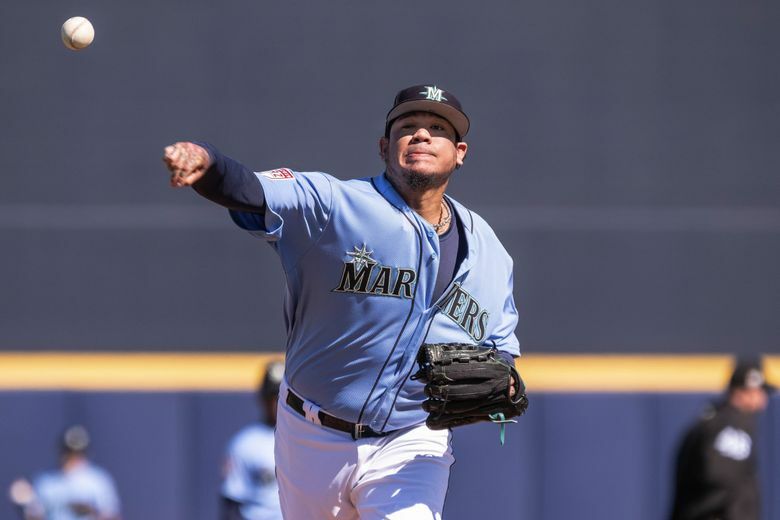 And like so often in those past outings, Hernandez’s results in Saturday’s game against the Padres offered a hopeful hint of effectiveness and a frustrating reminder of what has hindered him. After a near flawless first inning, Hernandez never made it out of the second inning. He registered just one out as the Padres scored four runs in the frame — all charged to him — in an eventual 6-4 loss for the Mariners. That first inning seemed crisp. Hernandez struck out the first batter he faced —Travis Jankowski — flashing a fastball that touched 92 mph. After Franciso Mejia reached first on a weak ground ball that was misplayed second baseman Shed Long for an error, Hernandez rallied to get Franchy Cordero to fly out to left and Austin Allen to pop out to short. The outing fell apart in the second inning. Hernandez served up a leadoff double to Jose Pirela. But it was a swinging bunt off the bat of Greg Garcia that started the meltdown. The ball rolled down the chalk of the first-base line, bouncing oddly from the clumps and holes in the dirt made from players’ spikes. Hernandez came off the mound and studied the ball’s path, seemingly waiting to grab it when it came off the line. However, home-plate umpire Chris Guccione never called the ball foul, instead signaling the ball fair when Hernandez touched it. With Pirela on third, catcher Omar Narvaez mishandled a breaking ball from Hernandez that rolled to the screen for a run-scoring passed ball. Hernandez hit a batter to put runners on first and second with no outs. He could have helped himself greatly when Allen Craig hit a hard one-hopper back at the mound. But the ball bounced off his glove and into right field, allowing another run to score. Boog Powell followed with a hard line drive to center for a sacrifice fly for another run and Jankowski blooped a single into left to end Hernandez’s outing at 42 pitches. The fourth run charged to Hernandez came when his replacement, Ryan Garton, allowed another single. Coming into the outing, the possibility of disaster loomed. 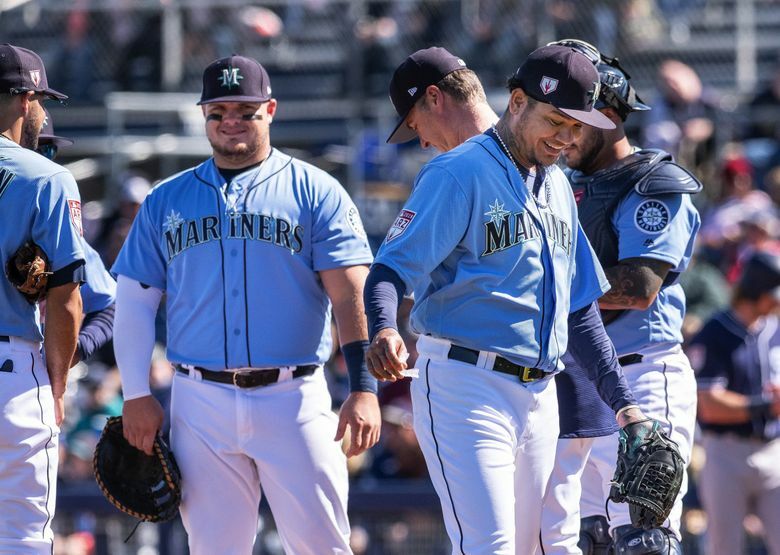 Servais said on multiple occasions that Hernandez looked “rusty” in the two bullpens and live batting practice sessions leading up to Saturday’s game against the Padres — the annual charity game. But one member of the Mariners front office wasn’t quite as kind. “It looked like he hasn’t picked up a ball the entire offseason,” he said. Hernandez said he threw two bullpen sessions and played catch in the offseason. But he struggled with his mechanics since arriving in Peoria. He made the decision to scrap his full windup for the first start and pitch exclusively from the stretch, even with no runners on base. Hernandez started thinking about the possibility in the offseason. 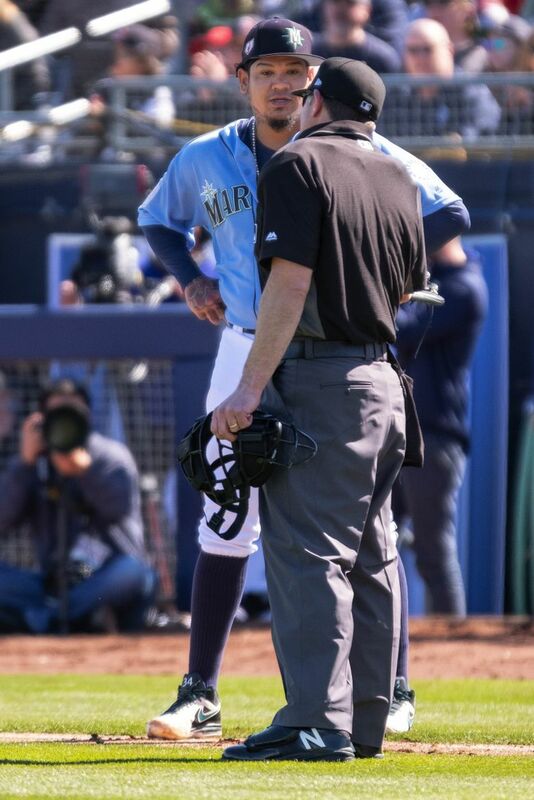 Servais and the staff are willing to accept any adjustment that might find consistency for Hernandez. Multiple starting pitchers, including David Price, Yu Darvish, Taijuan Walker and more throw exclusively from the stretch. “Maybe, it just depends on how I feel,” he said. Hernandez wasn’t happy or displeased with the outing. The missed call still irked him postgame. But he also understood that it was a spring-training game and, yes, the results don’t matter … to him.